Masala chai or tea is a common beverage consumed in India and other Asian countries. This milky chai is refreshing and helps improve mental alertness and eliminate weakness. 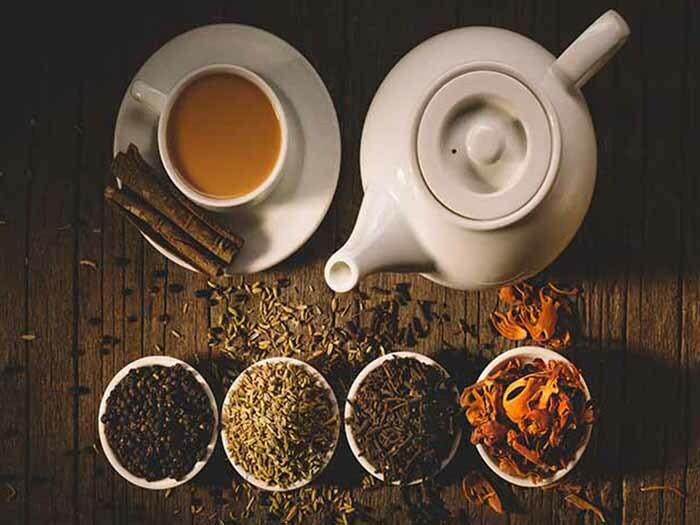 The various herbs and spices used in preparing this tea help in strengthening the immune system and protecting you against various infections such as a cough and cold. While you can find masala tea easily, it is fairly simple to make it at home. So, let us look at the ingredients and steps involved in making this delicious beverage. Share a cup of tea with your loved ones! To make masala tea, first grind cloves, cinnamon, ginger powder, peppercorns, and cardamom pods with a mortar and pestle. Then add water in a saucepan and bring it to a boil. Add the crushed spices to the water and let it blend well for nearly 3-5 mins on a low flame. Bring the mixture to a boil and add the tea leaves. Let it steep for 3-5 mins. Add milk and sugar as per taste and bring the tea to a boil. Turn off the heat and serve the tea with your favorite cookies! You can boil the milk separately and just add it to the tea and serve without cooking the mixture further. Sugar can be replaced with stevia, brown sugar, honey or jaggery. In case you are using honey or jaggery then add it at the end just before drinking the tea. Stevia is very sweet so make sure you add a little at a time.